The wild beach roses (rosa rugosa) are blooming in all their fragrant pink magnificence and I’ve been down to the Chappy point a few times, gathering their delicate petals to dry in the dehydrator, or stick them in a bath. I didn’t have time to lay them out in my dehydrator when I came home last time, so I stuck the plastic bag in the fridge. The next day I was making my morning smoothie, and I sometimes put raw baby spinach in it, and I had the idea to throw in some of the pink petals instead. I was pretty sure roses are edible, but to be on the safe side I did a little research and came across this sweet post. Rose flowers are considered an aphrodisiac that wakens feelings of warmth and love. They are also a simple astringent (this means that it tightens and tonifies inflamed tissue, both topically and internally where the medicine makes contact.) and rose is useful in treating conditions where the tissue is boggy, disorganized and puffy. My focus, recently, has been on ways to open and nourish my heart center, and allow more love in my life. I also am always on the lookout for natural ways to support my sensitive self and my tendency towards anxiety and depression, so the addition of rose and turmeric to my morning meal feels just right. Pour in a cup of hot water, or other liquid of your choice, unless you like your smoothie to be more like a slushie and very cold, in which case use cold liquid. Blend until smooth and creamy… and enjoy! You could also add a scoop of greens powder, or protein powder, or any of your other favorite smoothie additions. My dear friend, mentor and acupuncturist, Fae Kontje-Gibbs, co-hosts Thanksgiving dinner with an old friend and when she made this salad last year it was a huge hit. So, on the menu it went again this year. I helped her to prepare the salad this past November, shredding mountains of carrots and juicing many limes, and since then I have been hooked. The colors, textures and flavors are all fabulous, not to mention its nutrient-dense ingredients. Fae and I have a similar way in the kitchen–we often don’t measure with cups and spoons; instead we measure with our eyes, our hands, our tongues and our good old sixth sense. Quantities are approximate. Work with what you have and don’t be afraid to experiment. The key to the dressing is balancing sour and salt with the sweet of the currants (or raisins, or whatever dried fruit you have on hand), and using enough good extra virgin olive oil to make the dish satisfying and also to help your body absorb the good stuff in the veggies. Use organic produce if you can, especially the kale and carrots. a few tablespoons of fresh citrus juice lemon, lime, grapefruit or tangerine, or a combination of all three, with at least one lemon or lime. You can substitute champagne- or rice wine- or apple cider vinegar for the sour citrus if necessary. A bunch of carrots, shredded…about 2-3 cups. It’s fun to use multi-colored carrots if available. a bunch of kale, washed, pulled from stems and torn into bite size pieces. 1-2 grapefruits, peeled and “supremed” (the fleshy sections are cut away from the membranes )– my addition to the salad. Soak currants in citrus juice. Toss shredded carrots with a couple tablespoons of olive oil and some salt and then massage in the kale–think carrot salad with a generous portion of kale for color and texture, as opposed to kale salad with some shredded carrots. Add the currants and juice and toss to combine. Season to taste with salt and more lemon or lime juice. Gently mix in grapefruit sections. Serve immediately, or let rest as long as overnight–chilled and covered. Test seasoning again before serving; if needed, spruce up with a bit more lemon or lime juice and a touch of salt. It is New Year’s eve, and I am flipping through my binder of recipes and when I come across a recipe for date pastries that I had copied from a beautiful library book with recipes for baked goods from around the world. I consider attempting a gluten-free version of the pastry dough, and then I remember a muffin recipe I’d gotten years ago from a friend in Portland, ME. 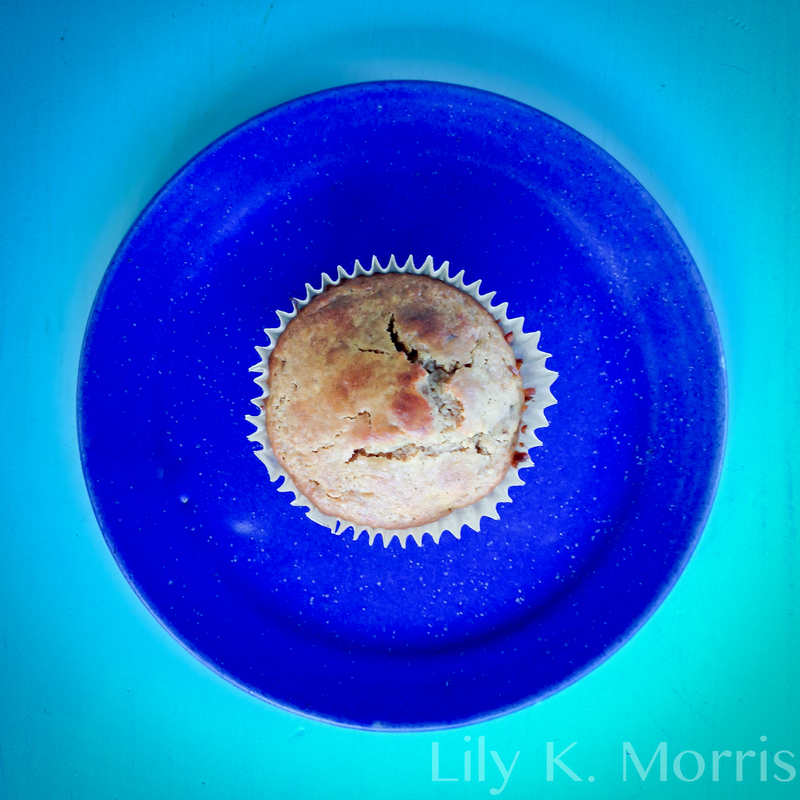 A chevre-filled muffin studded with dried fruit that we’d made during one of my visits to that dear city. For the last few days of the year 2014, I had a craving for dates. Not the kind of date where you meet a stranger for dinner, nor the kind of date you choose for a flight to warmer climes… Nope, I had been yearning for the rich, buttery, deep sweetness of a medjool date. And I wanted it warm, and a little gooey, with moist, buttery crumb surrounding it. I pull out the falling-apart old recipe book I’d started at age 13; a notebook that used to have a blue, card-stock cover on which I had written this quote: “Animals are my friends and I don’t eat my friends” (conveniently that page fell off around the same time I started eating animal flesh). The first entry in the book is for carob chip cookies because it was around that time when my mom and I started investigating the blood type diet, and being type Os, carob was supposedly a better option than chocolate. Although I loved carob, and that particular switch was easy for me, at the time I apparently wasn’t quite ready to adopt the rest of the recommendations for the Type-O diet, which included eating lots of animal (protein). It wasn’t until at least ten years later that I finally released myself from the vegetarian diet I had been raised on, and fed myself more of what my body really wanted to eat. Today, though, what it really wants is not meat, but DATES! Food writer Susan Russo describes them perfectly, “Medjool dates are deep amber-brown and have a slightly crinkly skin that shimmers from natural sugar crystals. Bite into one, and your teeth sink into satisfyingly sticky flesh that tastes of rich caramel, hints of wild honey and a touch of cinnamon. Melt-in-your-mouth Medjools are so luscious they taste as if they have been warmed in an oven.” from NPR’s “Kitchen Window” series. Flipping through faded pages, I find the muffin recipe and it actually calls for dried figs. I figure it will work just as well with dates, and I set the book out on the kitchen table ready for brunch on New Year’s Day. The first day of January 2015 arrives clear and bright, and making my way to the kitchen, I tie on my favorite green apron. I pull out the magical medjool dates, homemade chèvre and goat milk kefir, Pamela’s gluten-free baking mix, Massachusetts maple syrup, coconut palm sugar, Green Island Farm eggs, a meyer lemon–fresh from a friend in Florida, un-bleached parchment jumbo muffin papers…and I get baking! Preheat oven to 425°. Line nine jumbo or twelve regular sized muffin tins with unbleached papers, or oil thoroughly. Make chèvre mixture. Pit and chop dates. Sift dry ingredients in to mixing bowl. Beat wet ingredients together with sugar and then mix wet into dry. Fold dates into batter, making sure to separate clumps as you add them. Spoon batter into muffin tins. Top each one with a teaspoon of chèvre mixture (which should sink into center of muffin as it bakes) and bake for 15-20 minutes until tops are golden brown and a toothpick comes out clean. Cool for 5-10 minutes in tins before moving to a wire rack. Serve to people you love. 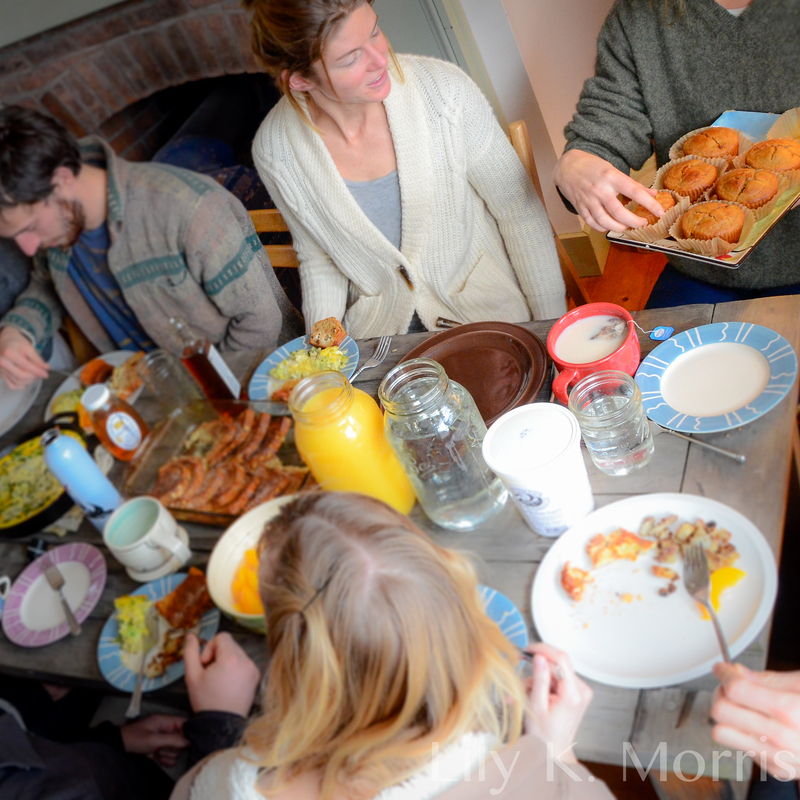 Sharing muffins with friends at Slip Away Farm! “It’s a sunny Saturday”…perfect morning for muffins! Preheat oven to 350°. Butter muffin tins. Stir together dry ingredients and wet ingredients separately. Mix wet ingredients into dry until just combined. For flapjacks, mix in an extra 1/2 C. of milk. Fold in blueberries. For muffins, spoon into muffin tins and bake for approximately 20 minutes (for smallish muffins, or longer for larger ones), until tops are golden and a toothpick comes out clean. Let cool for 15 minutes, and then loosen from pan with a knife. Serve warm with butter. Yum! For pancakes or flapjacks, spoon batter onto a well-greased skillet over medium heat. I like to do three, 3″ pancakes at a time. Cook until tops have bubbles, and are set enough to flip. Cook on other side for a couple of minutes. If batter is thick, try using a lid for a little while on the first side to help cakes cook through. Re-grease the pan between batches, adjusting heat as needed. Keep cakes warm in the oven, or better yet, serve and eat immediately with more butter and real maple syrup. Also yummy topped with yogurt and sliced bananas or strawberries. These muffins (and probably pancakes too) freeze quite well. Enjoy! are delicious, easy to make and healthy too! dill seed, cloves, whole allspice, red pepper flakes, cloves, etc. In a clean, quart sized (or bigger) jar with a tight-fitting lid, place some fresh herbs, a clove of garlic and a grape leave. Pack in the squash until jar is half full. Put in another layer of seasonings and a grape leaf and fill with more squash until top of vegetables are a little more than an inch from the top of the jar. Put in the last of the seasonings and top with a grape leaf tucked down around vegetables. If using whey, add to jar. Pour in brine until veggies are covered (this is key), and liquid is at least one inch from top of jar. Put lid on securely and label or mark the date somewhere so you remember when you started your pickles. Leave on the counter out of direct sun for three days. After this time, the brine should be nice and cloudy with lots of bubbles. Taste your pickles and if they’re sour enough, put them in the fridge and enjoy! If you want a little more kick, feel free to leave them on the counter for as long as a week (if it’s not too hot. Ideal temp is low 70s), making sure to “burp” the jar every day or two to release the pressure from fermentation. I find that 3-5 days is plenty in the summertime. 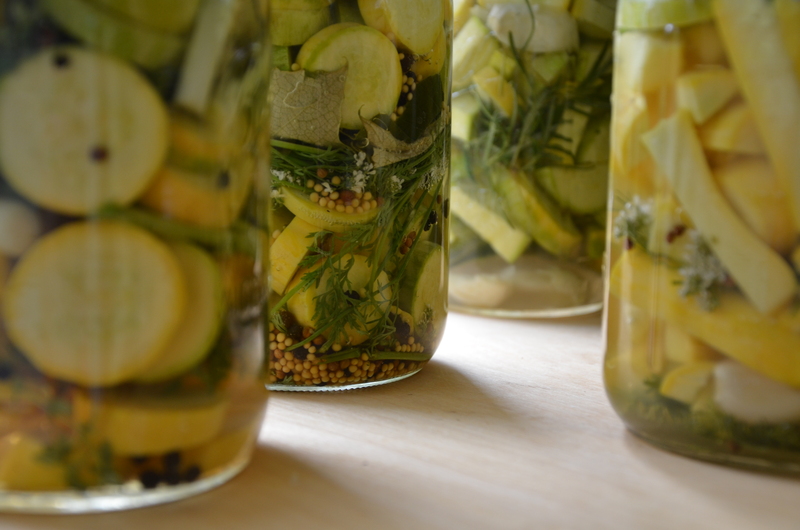 In cooler temperatures, the fermentation process is slower, and pickles can take up to a month or two to get nice and sour. 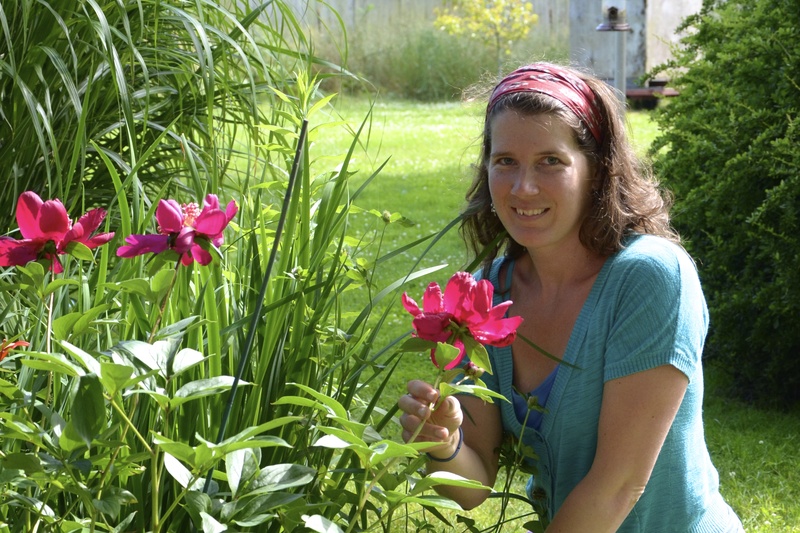 Lily K. Morris is a writer, artist, certified health practitioner and healing foods specialist, among other things. She loves to wander the woods and fields of Chappy in search of beauty, inspiration and nourishment. 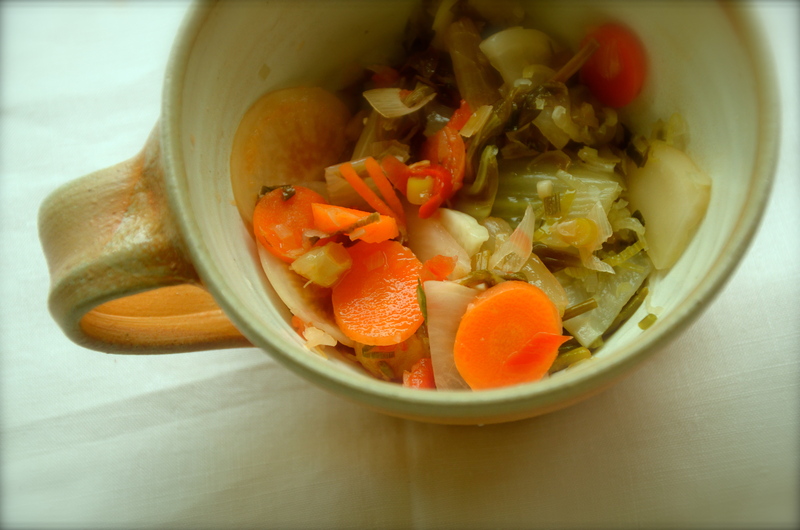 Find out more about making cultured and lacto-fermented veggies on her blog at http://www.waltzingwithwellness.com. Created for the annual Wasque Farm Fourth of July gathering on Chappaquiddick. What a treat to be able to use all local veggies and berries. Looking forward to Chappy dairy one day soon… This recipe makes a big, colorful potluck-sized bowl of salad. whisk in extra virgin olive oil…to taste and emulsify. At least 1/4 – 1/2 cup. Directions: Wash all veggies well. Spin lettuce, greens and herbs dry in a salad spinner or towel. Combine salad ingredients in a big bowl. 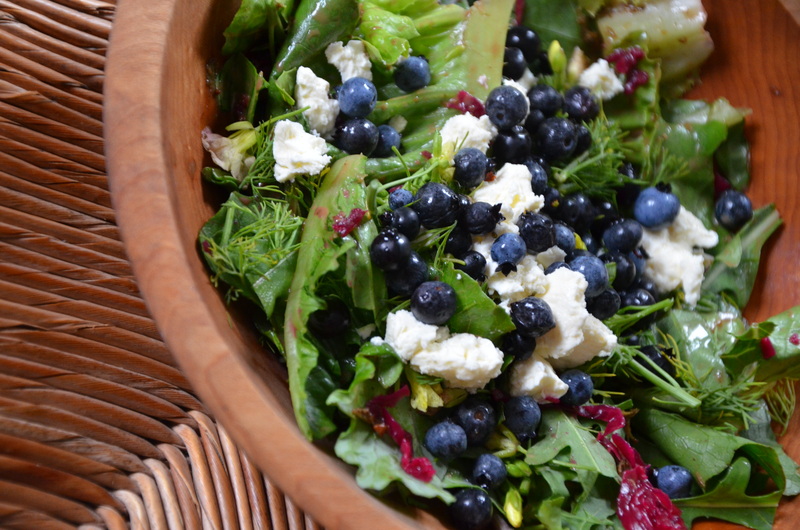 Blueberries can be added frozen if the salad will sit for a bit before serving–they will thaw quickly. Toss salad with dressing just before serving. Enjoy! Chappy Kimchi – a spicy, local pickle. Not sure what to do with Napa cabbage? Try out this delicious, healthy, lacto-fermented Korean pickle. You can make it as mild or as spicy as you like, and you may be surprised at how much the spice mellows during fermentation. Lacto-fermented veggies like this kimchi, or homemade sauerkraut, are a wonderful way to increase the beneficial bacteria in the digestive tract. Including lacto-fermented veggies as a part of your daily diet may contribute to better digestion and increased energy and overall well-being. Start off by eating a small amount daily (a spoonful or two) so as to let your digestion get used to this beneficial food. If it doesn’t taste good to you, and you don’t feel great after eating it for a couple of days, listen to your body–your system may not need or want it right now. Making kimchi is a bit of a process. It’s best to read through the recipe so you have an idea for the timing. Prep is a couple of hours, split. Kimchi is ready in about a week. *Veggies can be any combination of the ones listed, or any other fresh, fleshy vegetable you want to try. Try snow peas, cauliflower, turnip, etc. Experiment to find the combination you like best! *Spice mix can be any combination of spicy veggies. A more traditional kimchi uses grated ginger and fresh hot pepper or chili paste; though not yet available locally this season they add a nice, full flavor. It’s ok to have a lot of spice paste. Make brine: dissolve 1 tablespoon sea or kosher salt, for each cup of non-chlorinated water. Make about 4 cups to start, and mix a cup at a time if you need more. Prepare veggies: Wash veggies and roughly chop or slice as directed, except for spice paste ingredients. Place veggies in bowl and cover with about 4 cups brine. Place a plate with a weight on top; mix up more brine if needed to keep veggies fully submerged. Soak for at least four hours. Once veggies are limp, drain, reserving brine. Veggies should taste pleasantly salty. Rinse briefly if they are too salty. Once veggies are drained, mince or grate the ingredients for the spice paste. Add spice paste to veggies and mix well. Transfer veggies into quart-sized mason jar, packing well after every few handfuls to encourage release of juices. (use gloves for this step if you have sensitive skin.) When veggies are about two inches from top of jar, cover with a whole cabbage leaf and tuck in to make sure all veggies are covered with liquid. Add a bit of reserved brine if needed to bring liquid above veggies–keeping liquid about an inch from top of jar. Use an 8 oz glass ball jar full of water, or a zip-loc bag full of brine (must be salty in case it leaks) to weigh down veggies. Liquid should rise up around weight to form a seal and keep veggies completely covered with liquid. Cover with a light dish towel or cloth to keep out dust and place on a plate for overflow. Let ferment at room temperature, around 70° for about a week, or until done, and then transfer to fridge. Start tasting after 3 days–pull whole leaf aside and use clean fingers or a fork to grab a bit to try, then tuck leaf back in and replace weight. Kimchi is done when it has a ripe, sour, spicy and satisfying flavor. Spice will mellow as it ferments, and it will continue to slowly ripen in fridge. Speed of fermentation will depend on air temperature and can differ with each batch. Kimchi will keep for at least a few months in the fridge. A bit of “bloom” or foam on the top of the liquid is normal and can be skimmed off. If you find your veggies getting slimy, creamy, or brown, throw out the batch and start again. If it smells good and tastes good, it is most likely safe to eat. Use extra brined veggies for a delicious, simple sauté. Rinse briefly under cold water to mellow saltiness. Heat one T. coconut oil or ghee or your favorite cooking oil in a sauté pan or skillet over med-high heat and add veggies. Cook, stirring frequently, just until veggies are tender and wilted. If the veggies are fresh, they will be delicious just like this. You can also try adding some chopped fresh cilantro, lime juice, grated ginger and mirin (a sweet rice wine). Lily K. Morris is a writer, artist, certified health practitioner and healing foods specialist, among other things. She loves to wander the woods and fields of Chappy in search of beauty, inspiration and nourishment. Find her at lilykmorris[@]gmail.com.